Here is one of my all-time favorite picture characters in all the universe. Do you know him, too? To be sure, Don has brought to life a handful of tales beyond Henry’s, including one co-written with Michelin, Zuzu’s Wishing Cake (Houghton Mifflin, 2006), what School Library Journal described as a a paean to creativity and friendship across cultures, and the re-release last year of Daniel Pinkwater’s tribute to independent thought and self-expression, Bear’s Picture, originally illustrated by Pinkwater himself in 1972. He has also been a freelance illustrator for more than twenty years and has done editorial cartoons, comic strips, and conceptual illustrations for magazines and newspapers around the country. And, as you’ll read below, Don’s working on a new title, and it makes me happy. 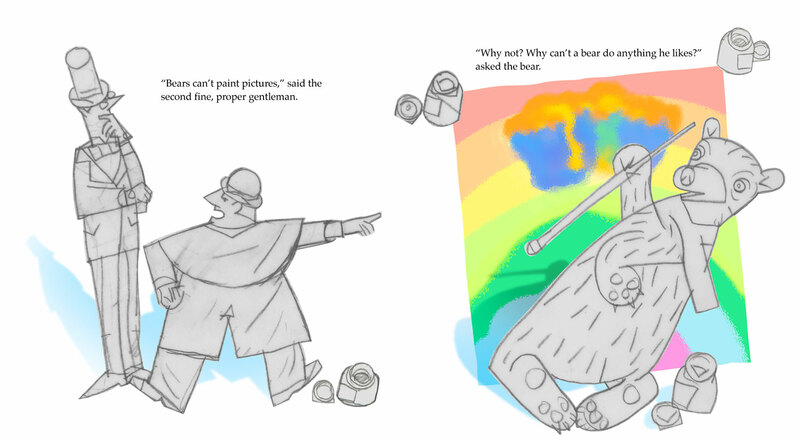 In fact, I can’t imagine anyone else doing a picture book about the subject matter of his work-in-progress. I’ll cyber-meet him at the café then, before his walk in the woods, and we’ll chat a bit. I thank him kindly for visiting with 7-Imp this morning. D.B. 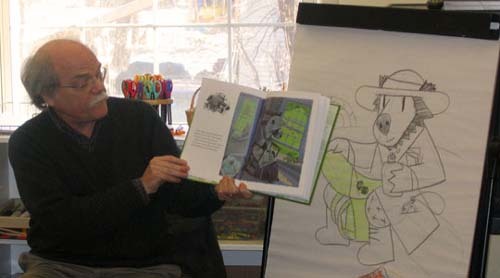 : I was an illustrator for twenty-seven years before I wrote Henry Hikes to Fitchburg, my first book for kids. 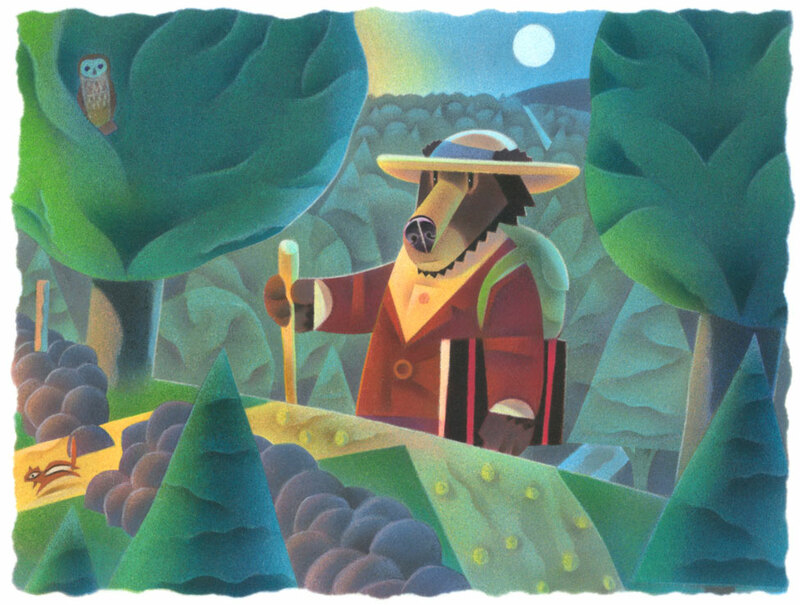 That book won the Ezra Jack Keats New Writer Award in 2000, so my writing career was officially recognized, even though I barely thought of myself as a writer. On the other hand, as an editorial artist, I’d been illustrating words and ideas for a long time and it seemed pretty natural to become an Author/Illustrator. D.B. 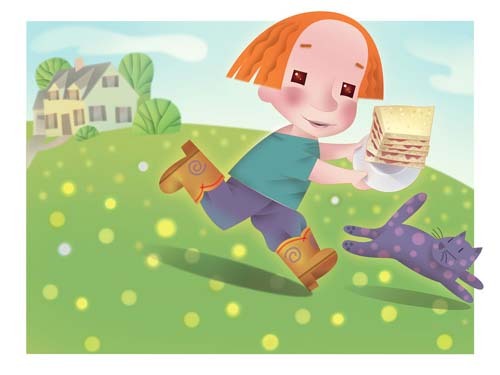 : Henry Hikes to Fitchburg (2000), Henry Builds a Cabin (2002), Henry Climbs a Mountain (2003), Henry Works (2004), Eddie’s Kingdom (2005), Zuzu’s Wishing Cake (2006-with writer Linda Michelin, my wife), Four Legs Bad, Two Legs Good (2007), Bear’s Picture (2008-with writer Daniel Pinkwater), and Henry’s Night (2009-co-written with Linda Michelin). D.B. : My medium-of-choice is colored pencil, applied over a thinly-applied underpainting done on coquille board. The underpaintings for the first four Henry books were created using an airbrush and acrylic paint. For health and environmental reasons, I now use Photoshop airbrush for this step of the process. 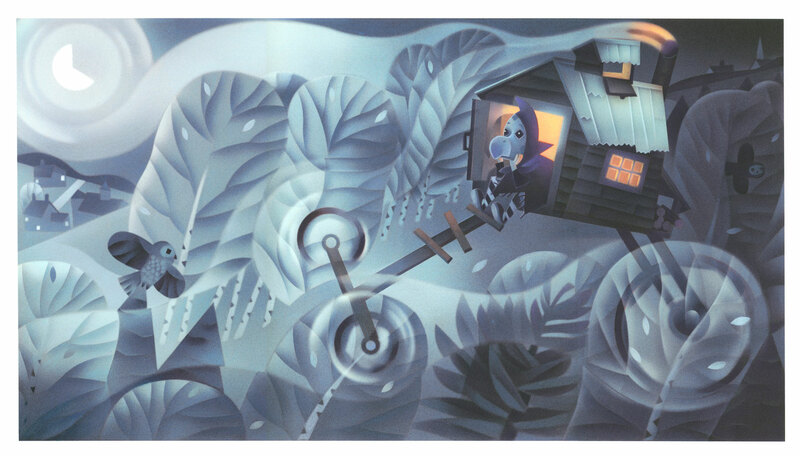 “Henry was nailing the last shingle when Miss Lydia peeked in the window. D.B. : I grew up in very rural New Hampshire, not far from where I live now. It was a wonderful experience to roam the woods and fields near our house—something I wanted my kids to experience when my wife and I decided to have our family. D.B. 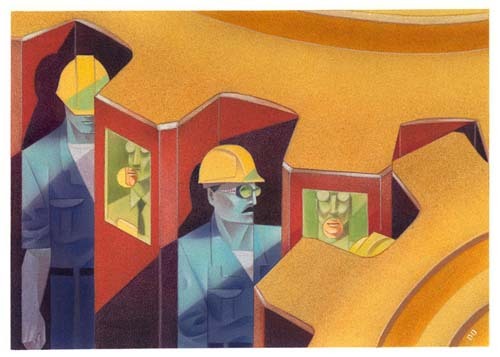 : In the mid-1990s, I was growing increasingly frustrated with waiting for art directors or my artist rep to call me with work that was becoming less challenging and less interesting to me. So, I made a conscious decision to take greater control of the work I would do. I had a long fascination with Henry David Thoreau’s Walden and decided to write a story for kids, based on a short passage I found particularly interesting. Thoreau mentions that someone asked him once why he didn’t take the train to Fitchburg to see the country. And he replied that he was wiser than that, for he knew that walking was the fastest way to travel. The paradox in that idea made me think it might be interesting to kids. 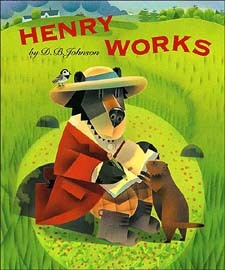 I wrote the story in about six weeks and sent it, along with a drawing of Henry as a bear (this was Thoreau for kids! ), to Margaret Raymo, a children’s book editor at Houghton Mifflin in Boston. I didn’t realize at the time that HMCo had been Ticknor and Fields, the original publisher of all Thoreau’s books. They were the perfect fit for my book, and Margaret called me two weeks after she received my proposal to tell me the good news. I loved the fact that this was a project I had complete control over, from initial idea to final art. I’ve been doing only children’s picture books since then. 7-Imp: If you do school visits, tell us what they’re like. D.B. : I do a few school visits each year. They are both exhilarating and draining. The Henry books are used extensively in elementary schools (and even high schools and college), so there are a lot of schools asking if I will visit. It’s difficult for me to say “no.” But, to keep to my schedule of a book each year (they take me eight to ten months to complete), I have to turn down a lot of requests. I do have one special program that’s become known as “A Day With Henry,” where I visit a K-12 school (usually an independent) and do a series of programs to multi-grade level groups for an entire day. One school referred to these as “one-room schools,” and they often consisted of two students from each grade level talking together about Henry the bear and Henry the author of “Civil Disobedience.” It is an amazing experience to hear a second grader say to a high school senior, “Well, if you had read Henry Builds a Cabin, you’d know how much it cost him to build.” I’ve done this program at schools in Viginia, Texas, California, and New Jersey. This year I’m back in New Jersey at the Moorestown Friends School. D.B. : I just finished my book for Spring 2010. It’s called Palazzo Inverso and is inspired by the “impossible worlds” of M. C. Escher. I have been interested for some time in creating a kids’ book that can be read front-to-back, then turned over and read back-to-front, but I could never seem to get a handle on how this could be accomplished. A couple of books by Anno were like this, but they didn’t seem to be stories the way I envisioned (Anno’s work is amazing and groundbreaking in every way). 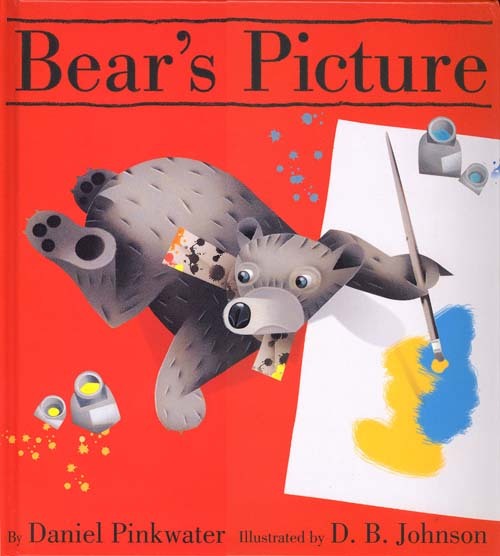 In Bear’s Picture, which I illustrated for Daniel Pinkwater, I have the reader turn the book upside-down at the end to discover what the bear is actually painting (a self-portrait! ), but now I wanted to explore whether that could be done for an entire story. That’s when my son, Reed (working on his MFA in writing at UVA), said to me, “The only art that can do that is M. C. Escher’s.” That was the revelation that launched Palazzo Inverso. Reed and I talked about what the story could be—a child apprentice working for a master builder of grand palazzos, does some mischief that causes the palace to be built upside-down (and not only that!). 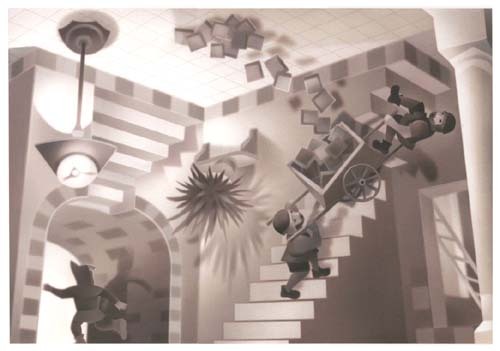 So I did the art that I hope captures some of the magic and playfulness of Escher’s endlessly looping stairs and upside-down interiors, while keeping consistent with my own drawing style. It was a challenging and mind-crazy experience. I think it’s the best work I’ve done—at least till my next book! Now if I could only figure out what that’s going to be…. Okay, the table’s set here in the café for our breakfast chat, and now we’re ready to talk more specifics. Once again, I thank Don for stopping by. D.B. : I begin with an idea—I have lots of them, but so few really good ones. I’ll spend some time researching whatever subject/person the idea is about, then write the story. My first drafts are usually way too wordy and I go through several drafts before I show it to my wife. She is my first-line editor, and she can tell me at this point whether I’m onto something really interesting or if I should abandon the story and move on to something else. I trust her instincts and her writing skills. If she likes what I have, she’ll offer suggestions on what needs work. Sometimes she edits, and other times she’ll stay more hands-off at this early stage. I go through twenty or more drafts of a story before it’s ready to be shown to our adult children who are my second-line editors (two writers and an artist who also writes). When the story is right, I break it into fourteen spreads to make certain the length and pacing are right. Often I do one drawing or painting that shows the main character, or I’ll create an entire two page spread for the book, if the design is somehow important. With Palazzo Inverso, I did a complete book dummy with pencil sketches and the type in place on the page, because to understand that story, the editor would have to read it in the context of pictures that would be right-side up for one passage and upside-down for a later piece of the story. My process is pretty much determined by what each project needs in order to satisfy me and to sell it to an editor. Once the contract is in hand, I begin final sketches, do a detailed mockup of the book, and start painting. Everything is planned, nothing is left to chance, including the positioning and style of type. All my books have been published by Houghton Mifflin, but Margaret has not accepted every proposal I’ve made. So, I know that it’s never a done deal until I’ve convinced her—and her focus is always on the story. She already knows I can do the art. The story is what will sell the book to her and what will sell it to book buyers in the end. D.B. 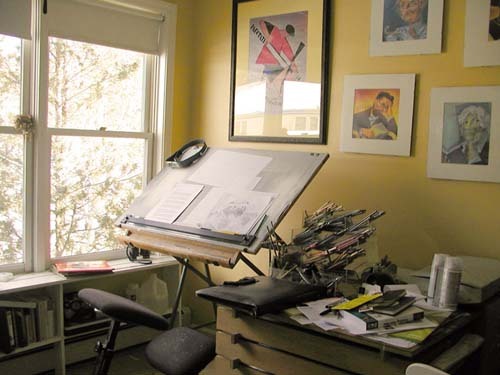 : My studio is small—aproximately 9 x 12—one of the three bedrooms we have in our 1000sq-ft condominium. It has windows along one side where I have a large drawing table. I also have an iMac G5 setup across the room. The walls are covered with framed cover illustrations I’ve done for the New York Times Book Review. Overall, it’s a very pleasant space with a birdfeeder on the window in the winter to remind me there’s still a world out there. D.B. : My mother went to the library every Saturday of her life, and when we were kids, she read to us a lot. 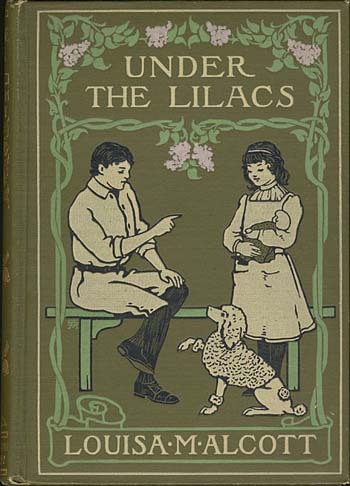 One book I particularly remember was Louisa May Alcott’s Under the Lilacs, about a boy and his pet French poodle who have run away from the circus. In school, the teachers read us Laura Ingalls Wilder and, as a young reader, I loved all the kids’ biographies of famous Americans. Later, I read a lot of stories about the Canadian north—books by Gene Stratton-Porter (A Girl of the Limberlost was one of my favorites). I remember one picture book about a family that moves to the country and has an encounter with a bear. 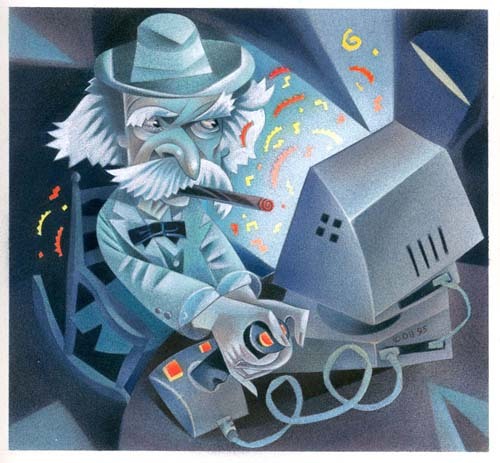 The style seems to me now to have been Thomas Hart Benton-ish, though I don’t remember who the illustrator was or even the name of the book. Mostly, as a child, my illustration influence was comic books and Mad magazine. I had an uncle who would draw funny characatures that I would copy. He also gave me a Walter Foster drawing book. I think I still have it somewhere. We always had a big box of paper to draw on—another uncle had a print shop and kept us supplied. 4. 7-Imp: What is currently in rotation on your iPod or loaded in your CD player? Do you listen to music while you create books? D.B. : My daughter writes songs and had a band in NYC called The Dowsers. I enjoy listening to her CD a lot. I like The Innocence Mission, Randy Newman, Leonard Cohen, Elvis Costello, and Jackson Browne (I created a “radio station” of each of them on Pandora Radio). I can listen to music with words when I’m painting, but when I’m working on a story or story idea, I prefer silence or electronic “space” music. Mostly my studio is rather quiet, and I’m always amazed when I see young people writing or working on their laptops with an iPod stuck in their ear. I can multi-task, but that’s ridiculous. 5. 7-Imp: What’s one thing that most people don’t know about you? D.B. : I’m a Vietnam veteran. D.B. : I’m turned on creatively by a challenge, whether it’s from the limitations imposed on a project or someone’s suggestion that something can’t or shouldn’t be done. 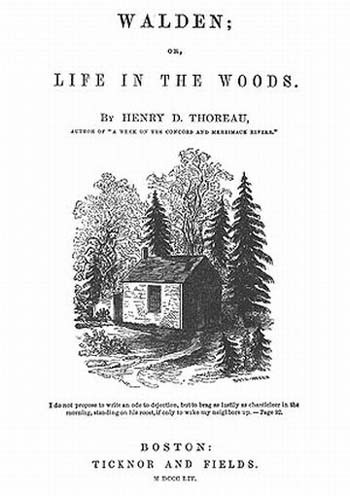 After one of my first readings at a bookstore when Henry Hikes to Fitchburg was published, a parent remarked that she loved how I presented Thoreau’s idea about the importance of the “journey,” but she hoped I wasn’t going to write about how he went to jail. That’s the moment I decided I had to write Henry Climbs a Mountain about the night Henry spends in jail for not paying his taxes. He refused to support a government that allowed people to own slaves. How could I not write that story? It’s one of the great accomplishments of Thoreau that his essay “Civil Disobedience” influenced Ghandi and Dr. Martin Luther King, Jr. The challenge was to write that story for kids. It’s my favorite Henry book. Sometimes the challenge can come from the project itself. Right now I’m creating a comic strip called “Lost Woods” that tells Henry’s story for older kids of all ages. It’s funny and, I hope, insightful. There have been two challenges with this project. First, the limitation of size—you have just four small panels to pull off a humorous sketch every day. And even if you can do that, how do you make your work different from others in such a small space? D.B. : The song of the whippoorwill. I remember it as a child, but I haven’t heard it for years. It plays a central role in my new book, Henry’s Night. D.B. : The car alarm—not just for its noise, but for what it says about what’s important to people. D.B. : I’ve never wanted to do anything else. D.B. : Medicine. I can’t deal with sickness or blood. 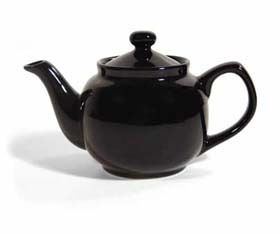 All illustrations and photos—with the exception of the book covers and the tea pot—courtesy of D.B. Johnson. All rights reserved and all that good stuff. 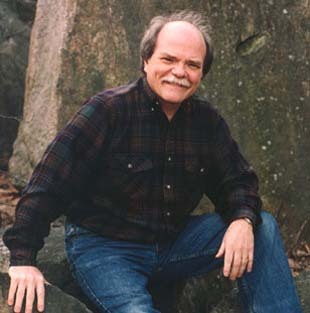 Note for other D.B.-fans: Don has updated his web site with a booksigning schedule. Oh, WOW. Henry is gorgeous — Henry’s Night looks fabulous. 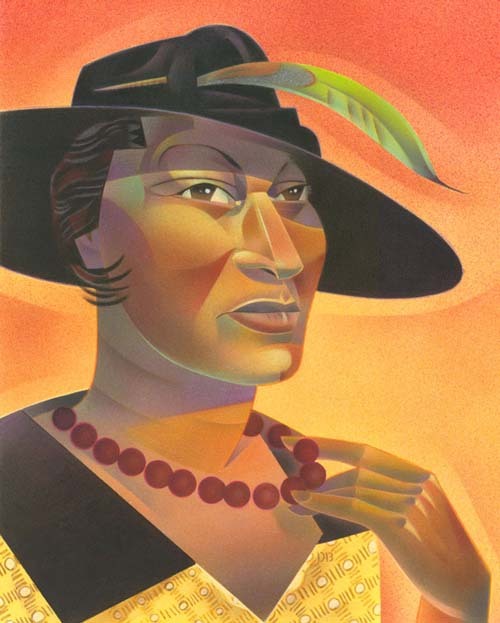 But the Zora Neale Hurston picture is what blew me away, as did the Escher. D.B. Johnson is amazing. What a splendid idea to take the essence of what Thoreau said and break it down in a way that younger minds will begin to grasp, understand, believe, and apply to how they walk deliberately in the natural world. It’s a brilliant first step in creating an environmentalist — not to preach to them when they’re older, but to teach them to appreciate when they’re young. Bravo. Turning my laptop upside down to look at those two pictures was hard work, but worth it. I have a copy of HENRY WORKS that I keep by my desk. I think it contains excellent inspiration for writers. I have been a fan of Thoreau, since I was eleven and introduced to the teachings of Thoreau and Emerson in *A Diamond in the Window* by Jane Langton. 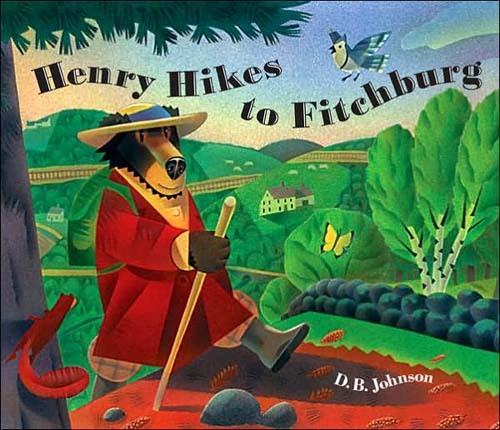 I will admit the art in *Henry Hikes to Fitchburg* took some getting used to–but Johnson’s stories are so powerful and *necessary*. And the more I see his art, the more I appreciate it. Radiant work. And as always, 7 Imp does it justice. Thoreau , his canine counterpart , and Johnson have much to teach us! Thank you for this latest offering . Love getting insight into the inspirations and methods of such creative souls. Awesome. I have loved D.B. 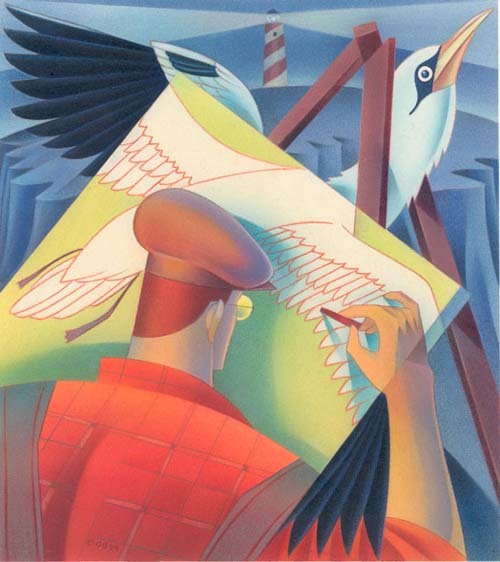 Johnson’s art for some time so it’s great to get a little insight. Thanks! Beautiful stuff. Henry Hikes to Fitchburg has been a favourite around here for years, but I had no idea there were follow-up books! What a unique style. Like Candice, it’s taken me awhile to really appreciate Johnson’s work. 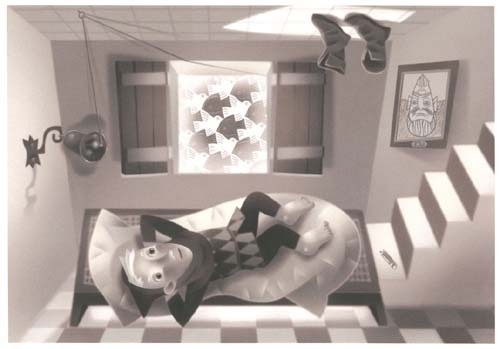 The Escher book looks absolutely amazing. I also didn’t realize there were other Henry books! Thanks for another beautifully presented interview!! I am digging the B&W Palazzo Inverso. I’ll have to pull up his listings at the library. Thank you for this interview! 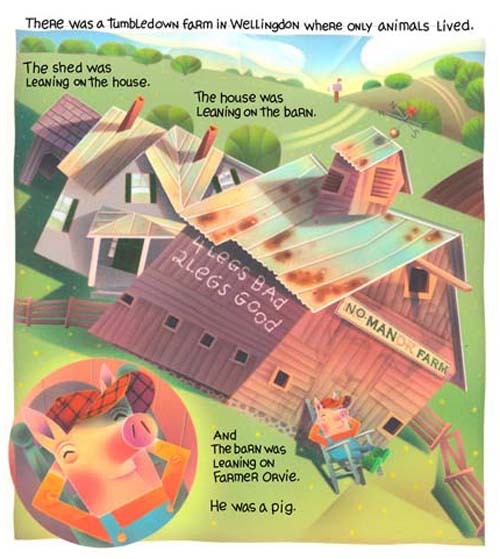 The Henry books made great read-alouds, and my favorite line is the last one in Henry Hikes to Fitchburg. 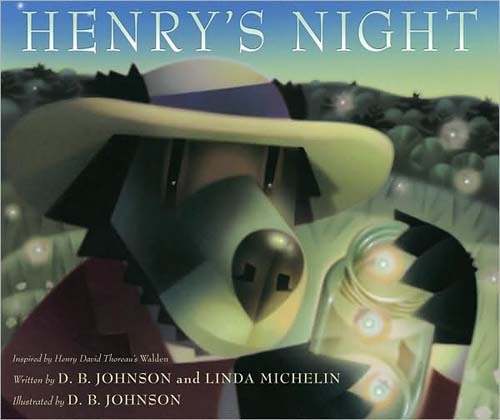 I’m looking foward to Henry’s Night, though I must admit that as a small child, I was terrified of the whippoorwill. I could hear it outside my window (or so I thought) and believed that it was a monster. My parents tried to convince me that it was a small bird, but nothing doing! I preferred the frogs and the crickets. Somebody else mentioned the Hurston image: yeah! A close second for me might be the hat-wearing rabbit (or is it a duck?) in the wolf’s mouth. And it thrilled me to see that he’s gonna be at Moorestown Friends School. I didn’t attend there but it’s so close to my childhood stomping grounds that it practically constitutes an endorsement of the latter! Wow, what a great article and interview! I love all of the 4 Henry books and am really thrilled to see that a new book is coming out this month! Excellent! What a fabulous interview. Thank you BOTH so much. It is so nice to see a comment section of a blog/website with such nice comments! No hateful vitriol or personal attacks. I was neighbor to D.B. Johnson’s sister, who shared his books with my brothers and I when I was younger. The art in his books contains such motion and energy…the books stick with the reader for years (unlike some childrens books, which tend to blend together after a while). Wonderful interview. BC: she was obviously talking about how she felt that the bulk of al-Qaeda’s operations had moved from Afghanistan to Pakistan and Yemen, which is mostly true, especially in regards to Pakistan.